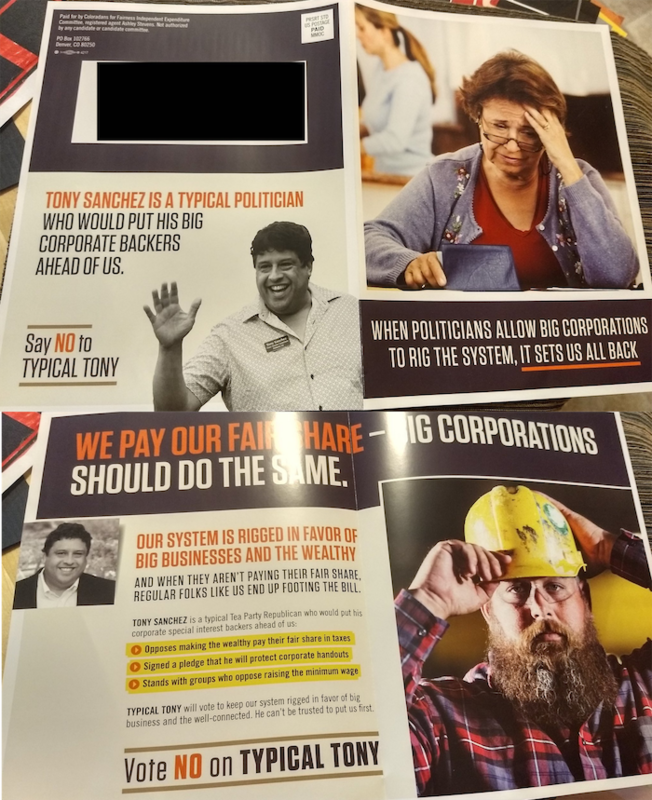 This mailer from Democratic super PAC Coloradans for Fairness says Republican Tony Sanchez, a candidate for the open Senate District 22 seat in Jefferson County, would protect corporate interests over people. It doesn't cite any sources for these claims however. Sanchez faces Democratic state Rep. Brittany Pettersen. Coloradans for Fairness is an independent spending committee or super PAC supporting Democratic candidates for state Senate. As an independent spending committee, the group may take unlimited donations and spend unlimited amounts, but it is not supposed to coordinate with candidates or political parties. Coloradans for Fairness received $1.1 million from nonprofit The Sixteen Thirty Fund; $200,000 from the National Democratic Redistricting Committee, which is chaired by former U.S. Attorney General Eric Holder; $150,000 from Education Reform Now Advocacy; $100,000 from the Green Advocacy Project, which advocates for clean energy; $50,000 from Environment America; as well as large donations from a range of Colorado businesses, including Anadarko, Anheuser Busch, PhARMA and others.